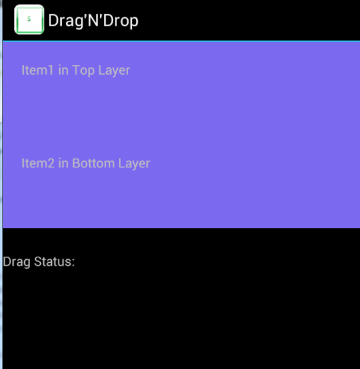 In this article, we will see an example of android’s drag and drop feature. Using drag and drop, we can move data from one View to another View. The framework mainly includes a DragEvent class, drag listeners of type OnDragListener and helper method startDrag. 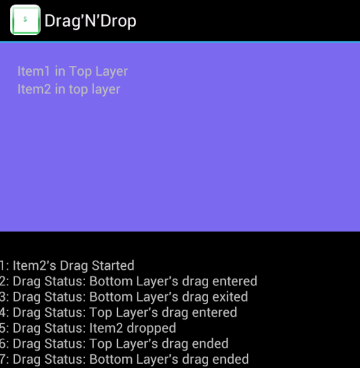 Let’s start building a simple drag and drop feature using the -android provided framework classes. Our example consists of two text items ‘Item1’ and ‘Item2’ which are in their own layouts. We want to drag the items from one layer and drop into another layer. We want to differentiate the views as we start dragging and dropping. We want one kind of drawable for the normal case where we are not dragging or for the case when we had just left the layer. Likewise, we want another style of drawable for the view as we start dragging the item or when we have entered another layer. To make the drawables, create normal_state.xml and drage_state.xml and add color element in each file representing different colors . Recognize a dragging gesture: User makes some gesture that you recognize as a signal to start dragging data. In our case, we will make the text items listen on OnLongClickListener to recognize the drag gesture. Register drag event listeners: Components interested in the drag events must implement drag event listener class View.OnDragListener. You set the drag event listener object for a View with the View object’s setOnDragListener() method. Respond to each drag event: Respond to each drag event. DragEvent‘s action code represents the drag state. Respond to drop event: When we drop the item, DragEvent‘s action code will be ACTION_DROP In our case, the views registered for the drag events respond by removing the text from its parent view and adding it to the view being dropped at. Our main page consists of two text fields in two different layers. 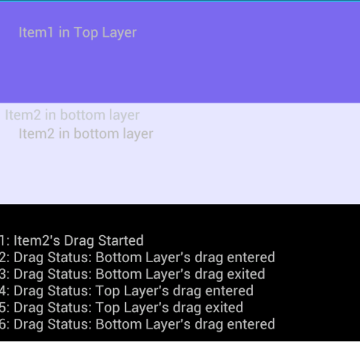 The top most layer contains Item1 and the bottom layer contains Item2. Both the items are draggable. For example, we can drag Item1 and drop in the bottom layer. Likewise, we can drag Item2 and drop in the top layer. We will now drag Item2. You can see the different events in the text field below the Item2. Drop Item2 in Item1’s layout.